One of the things that set Mad Mimi apart from other Email Marketing services was its price point, it was very appealing to me when I signed up to the service over 3 years ago. When you place it next giant services like Aweber, Get Response, Campaigner, and others, their prices could not be beaten. With all things consumer-related, you often hear “you get what you pay” and that's true, there's no doubt that the other services mentioned above beat out Mad Mimi in features and can achieve allot more complex functionalities, but is that enough to have higher pricing? Especially when Mad Mimi matches up where it really counts, which is email deliverability. That's the reason I used Mad Mimi because their emails got through spam filters just as good as the competition and at a cheaper price, it was worth sacrificing a few features. Now when a company that pretty much built its business on an enticing price point say they're upping the price, it sort of makes you wonder what's next. When I started building Mad Mimi in 2007, it was from a tiny coffee shop in Brooklyn. When Mad Mimi first launched, it was only a shadow of what it is today, but it delivered on our vision of providing a simple, beautiful product backed by loving customer support. We launched with pricing that I put together myself – no fancy market research – just what I thought was a fair price for what we offered. Well, it's nearly five years later. Over that time we have consistently listened to your needs and heard your voice, which has led us to invest substantially in product development and infrastructure in order to stay on the cutting edge of innovation and maintain exceptional security and data loss prevention. We strive to always do things the good way here in Mimi Land, and believe that has helped us make the Mad Mimi experience what it is today. This year, we launched Mad Mimi 2, an entirely rebuilt platform that added over 250 new features and completely upgraded the product from end to end, leaving no stone unturned. It's thus the right time for us to be making some increases to the price points of our paid plans. It's the first time in our history we've ever adjusted prices, and we made sure that our new prices are appropriate and have remained way way below what competitors charge for offering a similar service, so we hope you'll understand. Basically starting November 27, 2012, each plan will see an additional $6 added to it and if your list is over 50,000, there will be some sending limits in place. A $6 bump in pricing isn't so bad so long as it's happening just this once, for those with 50,000 contacts or more depending on your niche and how often you need to send emails — this could present a problem. I use Mad Mimi daily and the service fulfills my needs and even though I'm not thrilled about the price increase, it's still nowhere close to what you would be paying with competitors. 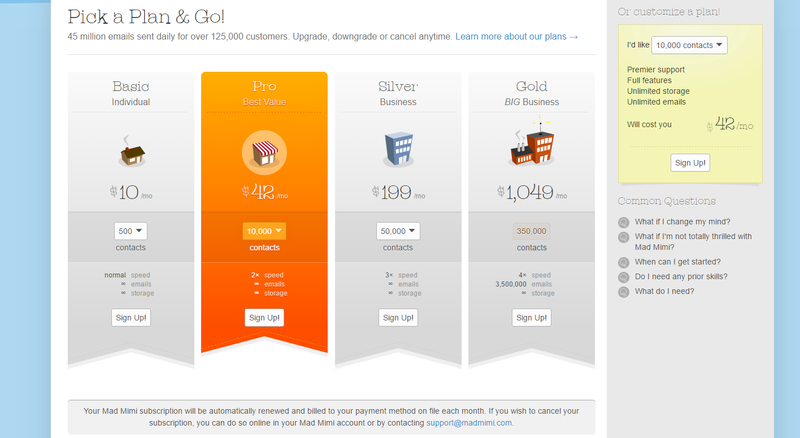 Now there is a silver lining, both the Drip Campaigns and RSS to Email add-ons are now Free to paid users. These originally cost $5 each before so your actually getting a $4 discount now. Is a $6 bump a big deal?